There is now overwhelming evidence that the for-profit arm of Vision Forum is indeed closing at the end of the year. Also, there are public statements alluding Doug Phillips’ public statement of repentance was not genuine. To save some time, I will relay each new development and brief summary in no particular order. At the end of the post, I will post a timeline so you can see how it all fits together. The biggest news you may have heard is that T. W. Eston at Jen’s Gems is reporting that Vision Forum, Inc., the for-profit arm, will be closing effective December 31, 2013. I’ve asked Mr. Eston if he could provide source information and he has respectfully declined in order to preserve his sources’ anonymity. I have numerous friends who are employed by VFI and have been told they will no longer have a job as of Dec. 31st, 2013. Tis true indeed. ditto! I can also verify that! Be sure to take a look at the post, because there is a lot of information – especially in the comments. But please keep in mind that none of it is confirmed with identifiable sources. I checked the Vision Forum site and the Vision Forum blog and there is no notice of this. 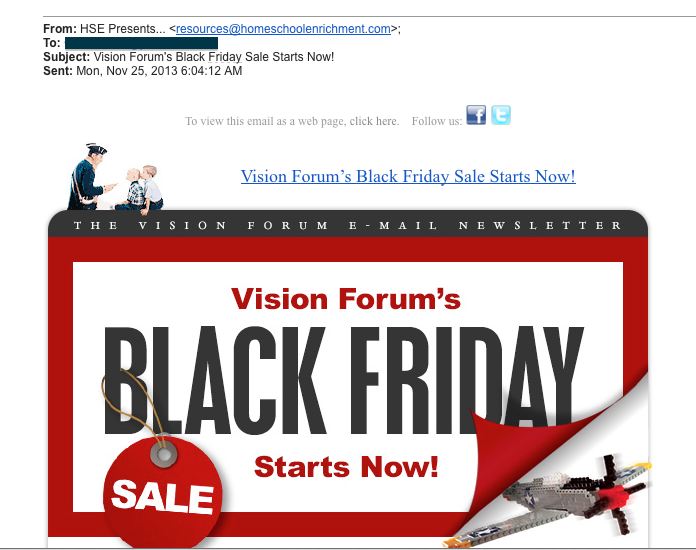 Home School Enrichment Magazine just sent me a Black Friday ad for Vision Forum’s Catalog. I could see Vision Forum sending it to me, but another homeschool company? Doesn’t that seem like an inappropriate endorsement given the circumstances? Maybe I am reading into it too much! Today at the Vision Forum site they are announcing the last day of Black Friday sale with 50% off everything. Maybe tomorrow will be 70% off everything? Did you catch the phrase, “financial concerns and for other reasons?” Inquiring minds want to know what other reasons. Were these men privy to Phillips’ personal affair and troubles? I wonder if we will ever find out. I am struggling with these questions as a homeschooling mom who has a huge amount of Vision Forum products in her home therefore has allowed my children to be taught by Doug Phillips. What do I tell them? That he was living a lie? Of course the Bible is the final authority on everything. Basically if you were to come forward with a similar confession what weight would all the books that you have written carry? Warn them about the cost of sin. Tell them how Doug has damaged his marriage, lost his home, collapsed his ministry, and devastated his family spiritually, emotionally, and financially. Tell them how the enemies of God are rejoicing right now; how people like you are in turmoil. This was not any small home, but a 6,000 SF home. Sadly, I predict a major lifestyle change for the Phillips family. The board of directors has given until the end of the year for Doug and his family to move out of the ministry-owned house. The VFM board of directors will repossess (and may have already repossessed) any and all assets that Doug purchased with VFM monies for his personal use. This includes everything from automobiles, home furnishings, and perhaps even clothing. Some may view this as retaliatory on the part of the board (and perhaps it is to some degree), but the fact of the matter is they have a legal obligation to do everything they can to remedy any tax fraud and fiduciary malfeasance that Doug Phillips may have perpetrated. The VFM board will be liquidating all VFM assets, including the house, home furnishings, office equipment and furnishings, all remaining inventory, and the Vision Forum office building at 4719 Blanco Road, San Antonio, starting January 1, 2014. On the Vision Forum’s YouTube page, there are quite a few new videos which were uploaded late September and early October, just about a month before Phillip’s announced he was stepping down from Vision Forum Ministries in his public statement. This is a screenshot of the page in case it disappears, but presently, you can see the videos here. The videos uploaded were part of the Vision Forum, Inc., for-profit arm and are advertisements for products in the Vision Forum catalog. Why would someone make the effort to produce a bunch of videos if they thought their business ship was sinking? This action convinces me that Phillips had full intentions of keeping his Vision Forum business afloat. Narcissists think like that. Just like the captain of the Titanic, they think they are invincible. This may or may not be significant, but I haven’t seen anyone discuss it and the new change occurred the month following Phillips stepping down or being forced out of his teaching elder position at Boerne Christian Assembly in February of 2013. Do you think he canvassed his wife, Beall and his household to get a big “Amen” for that? The Lord answered our prayers by granting us a top-of-the-line cruise ship, dedicated to our group. The tour will be 9-10 days beginning in Istanbul, Turkey and ending in Athens. Your teachers will be Dr. Joe Morecraft, Bill Potter, and myself. This is more clear evidence that Phillips has not repented as he has led us to believe by his two public statements. February of 2013: seems to be the month that most people agree that he stepped down from Boerne Christian Assembly where he was one of two teaching elders (pastors). March 26, 2013: The Vision Forum, Inc., affiliate program at Vision Forum, Inc., was suspended. August 2013: A blog article by Doug Phillips, True Repentance. Was he really thinking about his own repentance when he wrote/posted this article? Or was this to benefit someone else? September 5-7, 2013: Phillips spoke at the FORGE Ministries conference. September 20-20, 2013: Ancient Greece Tour in which Phillips was slated to teach, but did NOT. September 2013: Many Vision Forum advertising videos were uploaded to the Vision Forum YouTube account. November 11, 2013: Vision Forum Board announces the closing of Vision Forum Ministries. November 14, 2013: Doug Phillips issued “clarification” statement which only muddied the waters. November 26-27, 2013: Peter Bradrick comes forward publicly to share his involvement and pain. November 28-29, 2013: People coming out publicly on Peter Bradrick’s Facebook page insinuating that Doug Phillips profession of repentance may not be genuine. November 30, 2013: Notice on Vision Forum correspondence that they are liquidating inventory. Next postDoes the Doug Phillips et al Brand of “Biblical Patriarchy” Groom Stay-at-Home Daughters to be Victims of Abuse? I’m located near Deary and attend church there. I was going to say they might be in for a culture shock if they moved here! Although, I can’t say I’m keen on any cult group coming our direction! From what I know about this group, most likely the problems the group will face will be internally amongst the group. The women wear dresses and I’m pretty sure head coverings, so you may see them out shopping or doing business in town. Just going by appearance might be hard, but the town is so small that usually the residents know all about you before you even know your moving there! lol We have many groups in the county, including Anabaptist, Mennonite, and Hutterite, who where dresses all the time, but I don’t think we have any groups here yet that are wearing head coverings (besides the Mennonite caps). My daughter and myself wear dresses almost exclusively, although I want to make clear it is our own choice and preference and not because we’ve been told to do so. We are the only ones at our church that do and we do not judge those who don’t. We attend a wonderful little Bible church where Scripture is heavily taught (in context!). I think that anyone with cult inklings might feel a little uncomfortable! lol Newcomers may find this logging community to be kind of rough-and-ready. It is also very low income and can be a hard area. And if you are not used to real winters, it might be a shock. Deary hit -15° just a couple of weeks ago! There are a lot of wonderful people here, but I can’t say that all outside groups have been welcome.. It just depends on the attitude of the group. This area is full of tough people made that way be their environment and hard work. And most have a decent amount of common sense and practicality. If a cult was only intent on holding their group together, it might not be too bad for them, but if they want to grow their group this probably isn’t the most ideal place for that. Moscow on the other hand…. A question was asked earlier in this conversation thread about James Leininger, the benefactor to Vision Forum in its early days. Here’s something I read in a separate matter (Bill Gothard’s empire unraveling). This little blurb is not germane to the article, but was nestled in the middle of the article, which I think you all may find interesting. I wish to give him the benefit of the doubt that he is charitable. His stepping down from the board of VF just might be an indicator that he realized that not all was well with VF. And now, he’s realizing not all is well with IBLP (Bill Gothard’s empire). I feel for him that that his philanthropy has been spurned. May God give him wisdom in his generosity.